The ArtistScope Site Protection System (ASPS) is a two-part solution that provides the most secure web-viewing environment on the planet. Nothing is left unprotected to copy or exploit with the ASPS server filter delivering encrypted content to the ArtisBrowser on the user's computer. In fact ASPS provides the most secure web site content protection on the planet... secure from all exploit including packet sniffers when SSL applied. Prevents download and save of web pages, html and their content. Prevents Print Screen , screen capture and screen recording. Prevents media and image downloaders from obtaining links. Prevents all data leakage and protects database records. Protects all web page media including Flash, PDF and video. Delivers all web requests and responses using the strongest encryption. Supports all web applications, scripting languages and SSL. Supports easy integration with any third party CSS or DRM solution. No special treatment required for any media (no encryption required). The ArtisBrowser is a secure browser used to view ASPS protected content and supports almost all contemporary browser features so that visitors can seamlessly navigate through normal and protected pages. ASPS delivers web pages to the web browser in encrypted format that only the ArtisBrowser can decode. The content on the web site does not need to be encrypted and there is no double-handling required to prepare any web content for delivery via ASPS except for the inclusion of a HTML tag to trigger the ASPS filter. This means that anything delivered from a website, including database records, media and web pages created on the fly, will most securely be delivered from server to the user's web browser without any opportunity of copy, duplication or exploit. ASPS websites can contain a mixture of both protected and normal content (for search engines and casual visitors) without any segregation. Any pages that you want protected only need to include an extra meta-tag. When that tag is detected by the server it will be delivered in encrypted form, and only the ArtisBrowser will be able to decode that page and display it. Any other web browsers and devices will receive a legible error message, and even if they try to spoof the system, all they will get is an encrypted blob that will take NASA a month of Sundays to decrypt. How Does ArtisBrowser Compare To Other Browsers? Frankly, there is no other web browser that can offer comparable copy protection for web content. Yes, there are browsers that are designed for web exams that offer some user limitations but they cannot provide protection from all methods of copy and with such robust integrity that when SSL is used not even packet sniffers can be used to locate content or media. The ArtisBrowser is designed to leave no avenue for exploit. 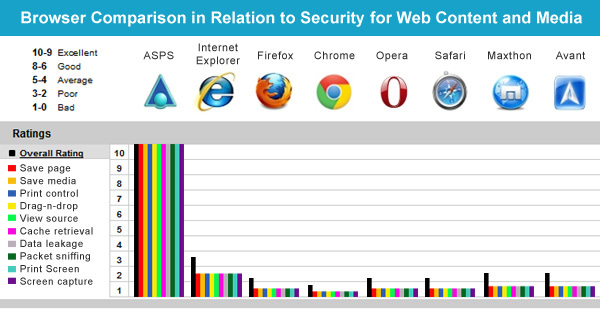 All of the web browsers available today claim to be superior, faster and more secure, but overall there is little difference. However there is one notable difference between ArtisBrowser and other browsers in caching. Caching stores HTML, images and media so that subsequent visits to a page will load quicker, and while that may be useful on news and other ad-infested pages, on copy protected sites the cache is a major vulnerability where media grabbers and video recorders can retrieve data directly. Consequently the ArtisBrowser does not cache at all. Caching only helps with revisits to a page and frankly, in today's internet environment, download speed is no longer an issue. ASPS protection can be applied site wide, to specific folders or to individual web pages only, and the protection applied can vary on each page. For example, you can allow a visitor to print a receipt but not copy it, or to save selected files to disk but not copy the page. ASPS does not employ DRM because most websites are already managed by membership solutions provided by a CMS like Drupal, Joomla, Moodle or WordPress. If DRM is required then the CMS should be modified and webmasters will be pleased to know that the ArtisBrowser provides extra server variables that can be used to identify each and every user, enabling them to enable access from specific computers only if neeed. ASPS and the ArtisBrowser utilize the renowned CopySafe windows service, as does CopySafe PDF, CopySafe Video and CopySafe Web. ASPS will most securely copy protect all content and media embedded on your web page, except PDF that can be viewed in Adobe Reader. The reason for that Is that even if the PDF is embedded on the page, it will still open in Adobe Reader which now provides all sorts of menu options for copy, save and print which cannot be disabled. So for PDF the only secure solution is to use CopySafe PDF for both desktop reading and web page view. CopySafe PDF can be displayed in an ASPS site or used as a standalone. First, you need to have a website on either the Internet or an Intranet. The next requirement is for you to have Server Admin permissions to be able to install software server side, ie: a dedicated or a virtual server (Windows or Linux). To use ASPS, the filter software needs to be installed on the server for your website. Installation is always performed by ArtistScope support team to ensure that the license file matches the server ID and that filter version suits your server OS. If your web site is custom coded your developer may be required to place the trigger tags into the pages that you want to protect (usually the header template). But if using one of the popular CMS like DNN, Drupal, Joomla, Moodle or WordPress, ArtistScope can provide a Tag Management add-on for your CMS. Site admins using a CMS can edit their ASPS Tag Management settings from a single page that will inject the ASPS tag plus meta-tags on the fly to pages that they nominate by keyword or url. For more info, please see ASPS Tag Management. ASPS can be evaluated by downloading the ArtisBrowser and exploring a variety of online demos. Click to visit the demo sites. ASPS software is licensed per server/site. Aliases and sib-domains of a domain can be included. Click to purchase the ASPS Server Filter software.